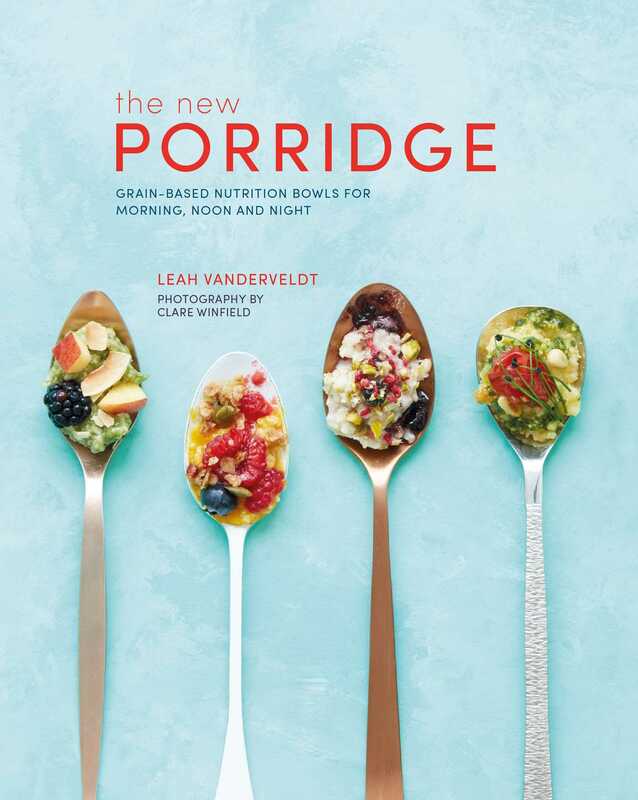 This book embraces the modern evolution of porridge, with 55 recipes including different grains, sweet and savory, hot and cold variations, there is a porridge for everyone and every season. One of the oldest breakfast dishes known to man has metamorphosed into the meal of the moment. The resurgence of porridge (oatmeal) can be dated back to the launch of the GI diet, since then it’s been talked about as a heroic superfood, thought to do everything from hoover up cholesterol, boost testosterone levels, fend off heart disease, suppress the appetite and help beat depression. Following its postmodern reinvention the term “porridge” has come to describe any nourishing grain bowl that can be built with ingredients ranging from traditional oatmeal to wholegrains such as quinoa, rice and millet. The New Porridge is all about creating a nutrient-dense, grain-based meal in one bowl and here nutrition and wellness expert Leah Vanderveldt brings you 55 inventive recipes. The book begins with a guide to making the perfect porridge base, followed by ideas for superfood add-ons and protein boosts. The Sweet & Warming chapter features the more traditional versions of porridge enjoyed in Western countries and includes Cinnamon Apple Pie, Coconut, and Mango. Next up is Savory and Cozy—which offers interpretations of porridge such as Asian congee and Italian risotto, as well as Shakshuka Porridge with Tomatoes, Chile and Eggs or a Red Lentil Risotto with Peas, Asparagus, and Lemon. Finally, Cold & Make Ahead is full of refreshing summertime bowls from bircher muesli to chia pudding, so that you can enjoy the new porridge any time of the day, all year round. Leah Vanderveldt is the food editor at health and wellness website, MindBodyGreen, where she writes and develops whole-food recipes and edits content about nutrition, health, and cultivating a positive relationship with food. She began her career in publishing at Condé Nast, working for both Vogue and Vanity Fair. When she moved to Sydney, Australia, Leah worked as a copy editor for lifestyle and design magazine Home Beautiful, where she focused on the entertaining and recipes sections. After teaching herself to cook through trial and error, Leah has managed to find clever ways to maximize flavour in dishes while focusing on plant-based whole foods. Her cooking inspiration ranges from her travels in Australia and Europe, to the more local flavours of her childhood home on Long Island, New York, and her dad’s fishing boat. She is certified in Culinary Nutrition from the Natural Gourmet Institute in New York City, where she learned to unite nutrition theory with practical techniques in the kitchen. She currently lives in Brooklyn with her husband, Fabian, who conveniently loves washing dishes.